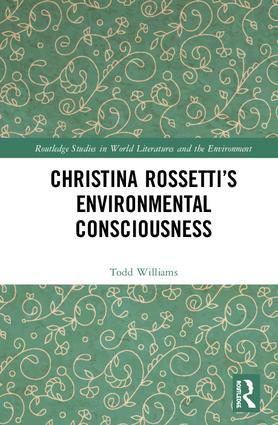 Christina Rossetti’s Environmental Consciousness　takes a cognitive ecocritical approach to Rossetti’s writing as it developed throughout her career. This study　provides a unique understanding of Rossetti’s identity as an artist through a cognitive model while also engaging significantly with her spiritual relationship to the nonhuman world. Rossetti was a deliberate and conscious creator who used her writing for therapeutic purposes to create, contemplate, maintain, verify, and, revise her identity. Her understanding of her autobiographical self and her place in the world often comes through observations and poetic treatments of the nonhuman. Rossetti, her speakers, and her characters seek spiritual knowledge in the natural world and share this knowledge with an audience. In nature, Rossetti finds evidence for and guidance from a loving God who offers salvation. Her work places a high value on nature from a Christian perspective that puts conservation over renunciation. She frequently uses strategies that have now been identified by Christian environmentalist such as retrieval, ecojustice, stewardship, and ecological spirituality. With new readings of popular works like "Goblin Market" and "A Birthday," along with treatments of largely neglected works like　Verses　(1847) and Rossetti’s devotional writings,　Christina Rossetti’s Environmental Consciousness　offers an understanding of Rossetti’s processes and purposes as a writer and displays new potential for her work in the face of twenty-first-century environmental issues. Todd Owen Williams received his PhD in Literary Criticism and Theory from Kent State University. He is currently an Associate Professor of English at Kutztown University of Pennsylvania where he teaches composition and literature courses including Literature and Psychology and Early World Literature. He has published multiple articles on literary pedagogy, and on Victorian authors including the Rossettis, William Morris, and Oscar Wilde. He is the author of A Therapeutic Approach to Teaching Poetry and a contributor to the volume Teaching Victorian Literature in the Twenty-First Century.